Veteran war photojournalist Sir Don McCullin has described a woman from a small town in India as a rising star. Story: Veteran war photojournalist Sir Don McCullin has described a woman from a small town in India as a rising star. Ranita Roy, from Andul, a small agricultural town near Kalkota, borrowed a high-quality camera to take the photos that have won her a prestigious international competition because she can’t afford to buy her own. 24-year-old Miss Roy won a scholarship to train with one of the world’s leading travel photographers, Timothy Allen, and now dreams of being a world-famous photographer. Sir Don, best known for his war photography and images of working class life, met Miss Roy at Xposure, an international photography exhibition in Sharjah, UAE, and tipped her for the top. Miss Roy borrowed her cousin’s camera four years ago to overcome depression and now describes photography as her ‘meditation’. Miss Roy’s traditional upbringing meant she had been expected to marry and have children after leaving school but she explained that wasn’t her destiny. Once she had convinced her father that photography was a hobby she would stick at, he bought her a basic, beginner’s digital camera using a payment plan. A family friend and fellow lover of photography became her mentor and now lends her his high-quality camera to take her award-winning photographs. But it caused a stir when she entered the competition as the owner’s name was still registered on the image’s metadata. One phone call cleared it up and Miss Roy has wowed the judges with her other photos. This week she attended Xposure, an international photography exhibition in Sharjah, UAE to collect her award. It was the first time she had left India, where she is an environmental studies student and yoga instructor. She described herself as “a small town girl with a big dream”. The Timothy Allen Photography Scholarship Award is run at the annual Xposure exhibition in Sharjah, which is attended by many of the world’s most prominent exponents. Sir Don McCullin (born 9 October 1935), is a British photojournalist, particularly recognized for his war photography and images of urban strife. His career, which began in 1959, has specialised in examining the underside of society, and his photographs have depicted the unemployed, downtrodden and the impoverished. McCullin is one of history's great war photographers. His interest in photography was sparked during his national service (1953-1955), when he served as a photographic assistant in aerial reconnaissance in the Royal Air Force. His photojournalistic career took off when his photo of a local London gang was published in the national daily newspaper The Observer. In 1964, The Observer offered him his first war assignment in Cyprus where he covered the conflict between Greek and Turkish Cypriots. After working as a freelance photojournalist for The Observer, The Sunday Telegraph, and magazines such as Paris Match, Stern and Life, Don McCullin became a staff photographer at The Sunday Times in 1966. During his 18 years at the The Sunday Times he covered numerous international conflicts to great appraise. His reportages include the famine in Biafra (1967), the Vietnam War (1968-1972), the Troubles in Northern-Ireland (1971), the fall of Phnom Penh (1975) and the civil war in Lebanon (1975-1982). After leaving The Sunday Times in 1984, he began to explore different kinds of photography, notably landscape photography. In recent years, he has focused primarily on the African content. Since 1995, he has been associated with Contact Press Images. Don McCullin has been awarded numerous awards including the Word Press Photo of the Year 1964, and in 2006 the Cornell Capa Award by the International Center for Photography in New York for his lifetime contribution to photography. 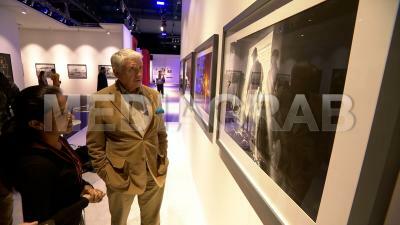 In 1992, he became the only photojournalist to be made Commander of the British Empire (CBE). We are passionate about photography and, we are dedicated to supporting the visual language in all its splendid genres. Photography is not about our tools or capabilities, it’s about our eye, and this is life. Evolution, variety, effort, joy, memories, pain, and hope all subjects of the single international language and behind every picture there is a story. We are keen to recognise and promote regional and international emerging photographers and film-makers, and we offer free to enter competitions; providing a platform for photographers and film-makers to show their work and open the door to new opportunities. To establish Sharjah, already regarded as the cultural heart of the United Arab Emirates, as a global platform for the visual language of photography by gathering photographers of varying skill sets, from around the world, to engage, share knowledge and exhibit their work in a custom designed and dedicated indoor area along with several outdoor regional locations. TAPSA stands for Timothy Allen Photography Scholarship Award. The award will be offered to a total of 5 photographers who have entered a portfolio of images that represent the best of their work shot within the last 3 years. This portfolio can comprise one or more stories or just a selection of single images.Entries will be judged individually and as a portfolio. Timothy Allen will be looking for those photographers showing the most ingenuity and originality as well as photographic excellence in both image making and storytelling. The Photography Scholarship Award winners received a 10-day package to Sharjah, UAE and will participate in a 5-day photography workshop with Timothy Allen, that includes assignments, a portfolio review, one-to-one coaching, location photography training and the opportunity to present their work and story to a live audience in the main auditorium. Scholarship winners will also benefit from opportunities to meet some of the great names in photography and receive an additional portfolio review from a leading Director of Photography or Photo Editor and further experience seminars, additional workshops.